“HOLA Amigos”. Yep that might just have been how I’d walked out after a breezy Mexican lunch at Oakleaf. Oakleaf is the restaurant in Oakwood Kapil, right in center of the Financial district. This is the first food festival at Oakleaf and what better way that to kick it off with Mexican. The menu options are evenly balanced between vegetarian and non-vegetarian served in huge-sized portions. So yeah if you are looking for your Nachos and Burritos fix, you might as well walk into Oakleaf to have them over some lovely cocktails that they’ve been whipping up. We started off with the Fajita Nachos with the Nachos being served on a bed of refried beans and cheese. The pico de gallo was truly good and freshly made. I’m going to be honest that I did switch to the non-vegetarian side of the menu quite fast having a bit of the vegetarian bites. The Layered Tortilla Pie was quite interesting and a looked like a true Chef’s take on the Lasagna. The tortillas had been layered in between beans, jalapenos, lotsa cheese, picante sauce and baked. The icing sure had to be the guacamole and sour cream on top. Another of the delicious dishes and quite a color highlight had to be the Mexican Fire Rice. The rice had been cooked with vegetables and cheese, sour cream, jalapenos, capers and cilantro with this in turn had been filled into bell peppers with ranchero sauce and cheese. Baked and Cheese had truly become synonymous with delicious. Moving on to the non-vegetarian section of the menu, the Texas Fajita and Fajita Tacos were quite good. The tortillas had been prepared fresh with the sour cream and pico de gallo again playing wonders with the dish. The Carne Asada at Oakleaf is served in a baguette. In between is a juicy piece of steak topped with sweet onions. The Chicken, Red Beans and Rice Burrito was quite good too with a mix of Mexican spices. 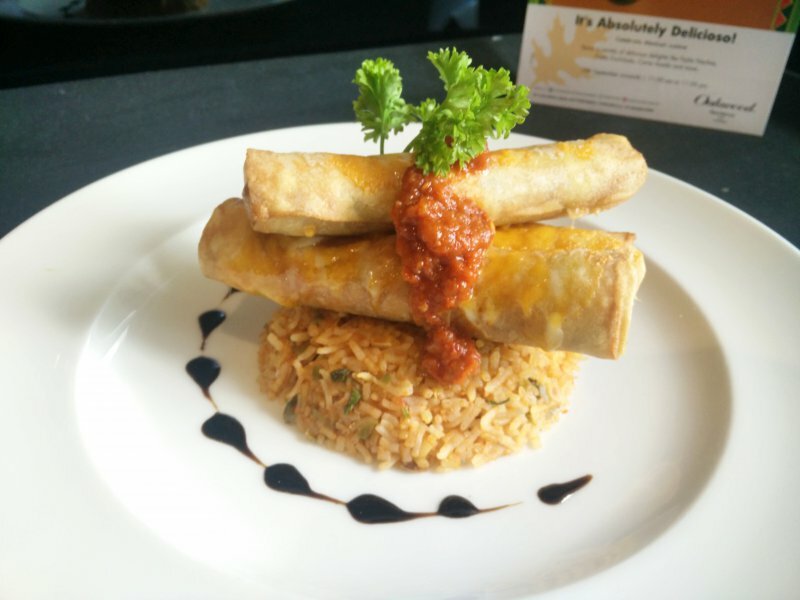 The Mexican Food Festival at Oakleaf is one way to go delicioso for your taste-buds. The have a really nice and compact menu with most of the dishes right. It’s on from 19th Sept. – 2nd Oct with most dishes being priced between Rs. 400-600.